Why does the Sun seem red near the horizon? Why does the Moon do the same? We know the Moon isn’t actually changing colour, and the Sun isn’t either. So what is happening to the light? 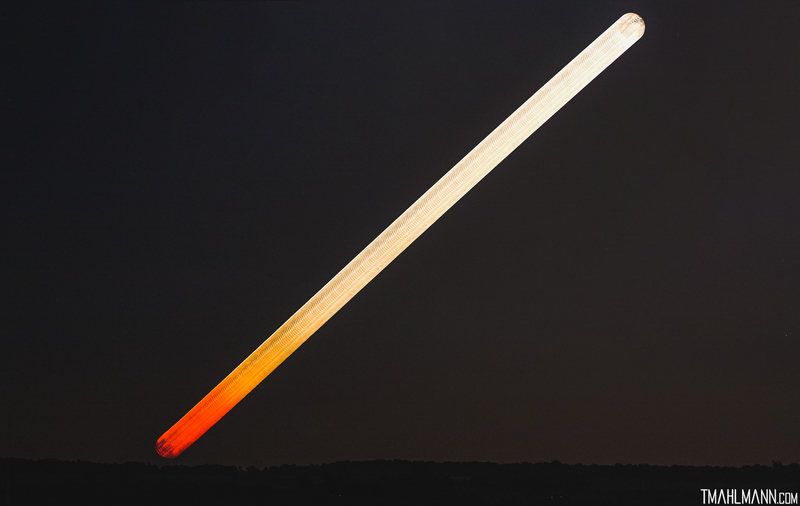 The first thing to note about the image above is that the size of the Moon doesn’t change, showing that the well-known ‘Moon Illusion,’ where the Moon appears larger near the horizon, is just that – an illusion. The second is of course the gradual change in hue as the Moon rises. The reason for the colour shift really has nothing to do with the Moon itself, and everything to do with the Earth and with the observer. The colour is caused by Rayleigh scattering, where certain wavelengths of light deflect off molecules in the atmosphere. 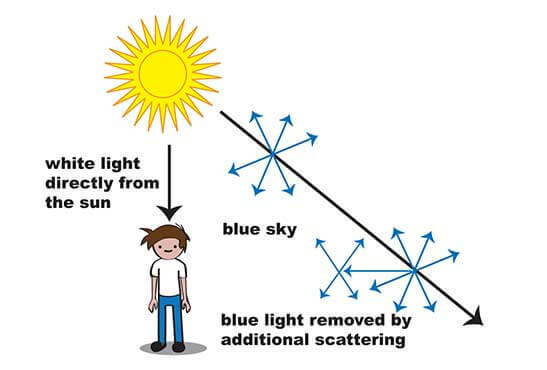 The scattering occurs mostly with the shorter blue and green wavelengths of light, since their wavelength is comparable to the size of the atmospheric molecules. If you take sunlight, made up of all the colours of the rainbow, and remove the blues and greens, you end up with reddish light, hence the red colour. Okay, but we are always seeing the Moon through the atmosphere, why do we only see the red hues near the horizon? The answer is that near the horizon, we see light from the Sun or Moon pass through more atmosphere. More atmosphere = more scattering. So the Sun and Moon look redder near the horizon, because more of the blue and green light has scattered away. But where does this bluish light go? It can’t just disappear. The answer is that it still reaches Earth, but it travels along a different path. A blue photon from the Sun could hit millions of molecules each, causing a change in direction, but it will eventually reach the surface. For an Earthbound observer, this means that scattered blue photons appear to come from all directions, making the entire sky blue. Yup, that’s right, this is why the sky is blue! Furthermore, the lack of blue light makes the Sun appear a tiny bit reddish when overhead, which is expressed as yellow! 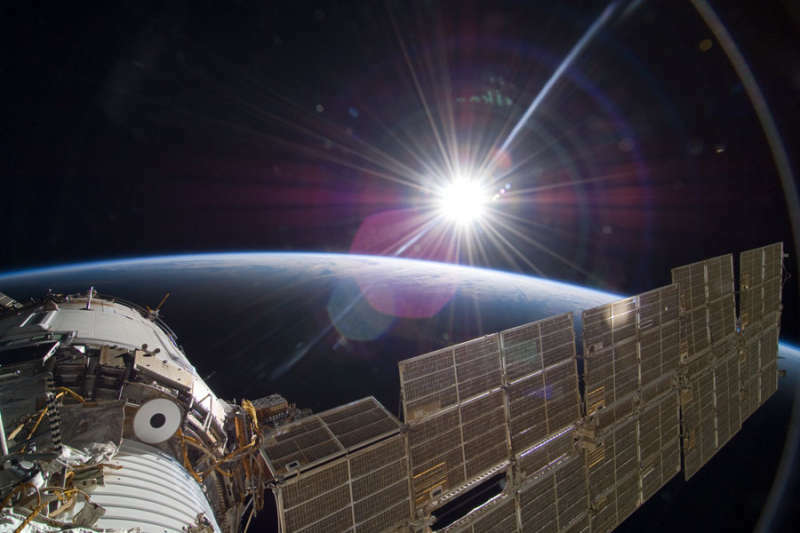 The Sun’s light is actually white, and is easily seen from space. So there you have it, our atmosphere makes the sky blue, the Sun yellow, and both the Sun and Moon reddish at the horizon. Rayleigh scattering makes things beautiful.